All Dance Co-op classes, jam, and performance will be held in the Fine Arts Building in the Studio Theatre, Room 137. 502 S. Cooper St. Arlington, TX 76019. Dance Co-op participants will need to purchase visitor parking passes for Thursday 8/2 and Friday 8/3. There is open/free parking on Saturday 8/4 for classes and the performance. A visitor pass may be purchased in advance for $8/day here, allowing participants to park in any student or general lot (Lot 34 is recommended). You may also pay $3.25/hour to park in the new West Campus Parking Garage. 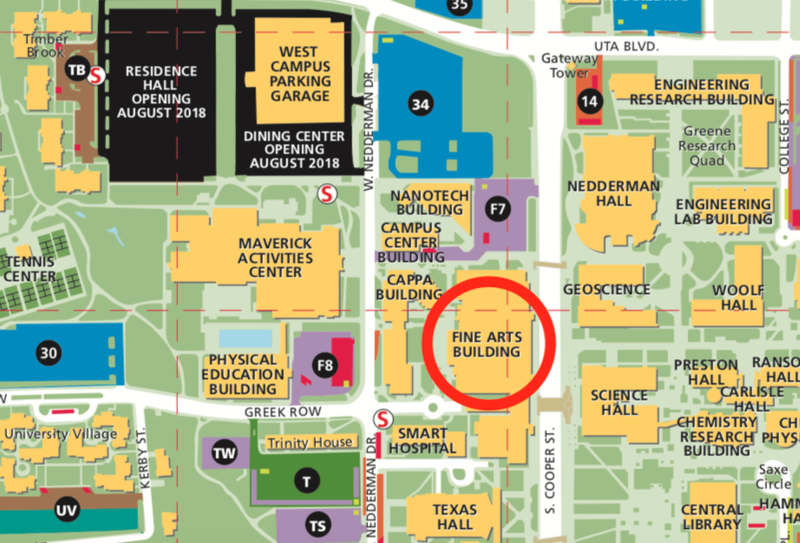 The Fine Arts Building is large, so see video below to help you find the Studio Theater once inside. Click here for nearby places! Additional donations are accepted at the door - All donations support the Dance Co-op Scholarship fund. ​Online donations may be made via PayPal here and checks may be made payable to Big Rig Dance Collective, LLC. Here's a video walking into the Fine Arts Building through parking lot F7 (Cooper St. on left, Nanotech Building on right) to help orient you.